The Skoda Yeti has all of the advanced features that people love like fuel efficiency, advanced safety features, and great power output. It also has a unique design that is both comfortable and practical. The sharp steering and fine body control make the Skoda Yeti fun to drive. Massive cabin with versatile seating. It features a 5 seat design and a convenient 5 door layout which gives you quick and easy access to everything inside. You can enjoy a stunning 6.4 L/100km or 44.10mpg fuel efficiency and the safety features you want like ABS, airbags, and more. 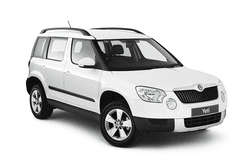 Check out the Skoda Yeti now for yourself and see what quality design and comfort touches looks and feels like!